View of “Laure Prouvost,” 2018. 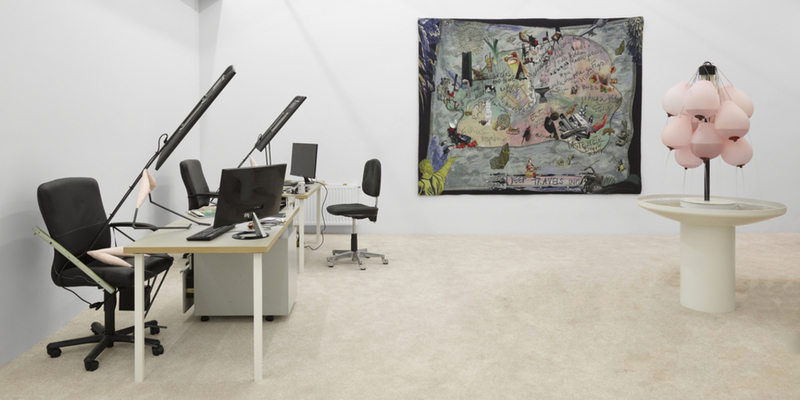 As a reconfiguration of a 2016 exhibition at MMK Frankfurt, the installation may be forgiven for attempting to weave together too many commentaries into its tapestry, but ultimately, Prouvost’s simplest inventions are the most compelling: a fountain composed of leaking breasts, hiking sticks fitted with truck mirrors, and a fish tank in which a clunky video camera has been submerged. More of that liquid vision could have served it well.